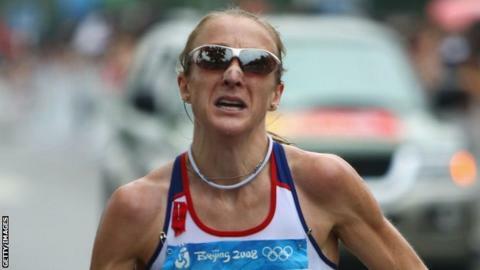 Paula Radcliffe's long-time physio says she has been "torn to shreds" by the blood doping allegations she claimed implicated her. Radcliffe, 41, has defended three 'abnormal' blood results after her data was made public. Irishman Gerard Hartmann worked with the Briton from 1997 until 2012. "It is like someone has put a dagger through the front and someone else has put one through the back," Hartmann told BBC Radio 5 live. "Paula has been hung out to dry. I have spoken to her every single day. This has torn her to shreds. "The allegations have smeared her and threaten to destroy everything she stood for throughout her career." At a parliamentary select committee on Tuesday, Jesse Norman MP suggested London Marathon winners and medallists and "potentially British athletes" were under suspicion of blood doping following the Sunday Times' allegations of doping in the sport. She is a former world marathon, European 10,000m and Commonwealth 5,000m champion. British athletes Mo Farah and Jo Pavey say releasing blood data information should remain the choice of an individual. Radcliffe has said she will not make her blood test data public but has commented on the three 'abnormal' results, following the doping allegations. Both Farah and Pavey published their blood test data to prove they are clean. Farah, Olympic and world champion at 5,000m and 10,000m, said: "It's up to each athlete to do what they feel comfortable with. Myself and Jo, we felt comfortable. But it depends on who you are and how comfortable you are. "For me it was a way of showing the critics I have nothing to hide." European 10,000m champion Pavey added: "It should be a personal decision and people shouldn't be put under pressure to do it one way or the other." Greg Rutherford, Olympic and world long jump champion, has defended Radcliffe, saying her achievements should not be greeted with suspicion. "Paula Radcliffe is one of the greatest athletes that Britain has ever had," he told the Telegraph. "To have to go through all this is horrible and a lot of clean athletes that have done will have had this at certain times. "That's the problem with the sport. It's terrible to think that anybody who does well, the insinuation from a lot of people immediately is that it must be drugs. It's sad."